In 2019, apartment complexes and rental management groups are no longer limited to one evaporative cooling rebate per program year. However, pre-approval is still required for applications of more than 10 units. Customers are still limited to one rebate per individually metered NM residential account per program year. Did you know that evaporative air conditioning systems use less electricity and are less expensive to install and maintain than refrigerated air conditioning? In hot, dry climates evaporative cooling is a cost effective and energy efficient way to cool your home. An evaporative cooler is essentially a large fan with water-moistened evaporative pads in the air stream. The fan draws warm outside air through the pads and blows the now-cooled air throughout the house. Evaporative cooling is an open system and takes air from outside the house. For evaporative cooling to work properly, the cooled air must flow freely throughout the area to be cooled. By choosing which doors or windows in your home to leave open, you can direct the flow of cooled air to areas where cooling is needed. Evaporative Air Conditioners MUST be purchased and installed in the current program year and listed on the Evaporative Cooling Unit Eligibility List to be eligible for a rebate. Must be permanently installed with a single duct or ducted air distribution system (portable units and window units are NOT eligible). Limit of one (1) rebate per individually metered NM residential account per program year. 2. Customers may also elect to pursue a Residential Comprehensive Evaporative Cooling rebate without the help of a contractor. 3. 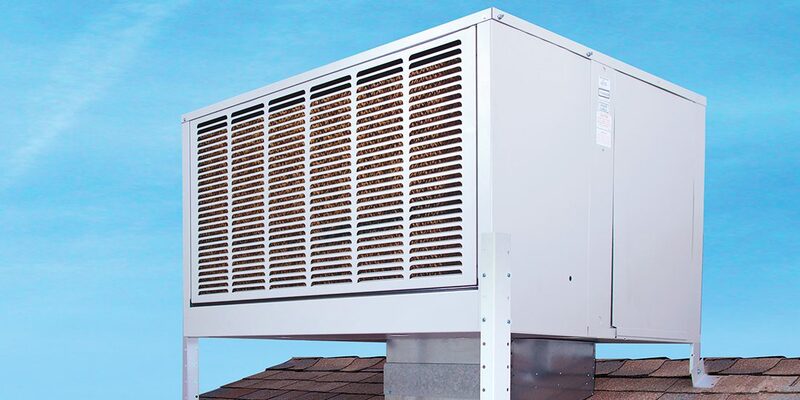 Purchase a unit that is listed on the Evaporative Cooling Unit Eligibility List. 4. Once a new eligible evaporative air conditioning unit has been installed, the Evaporative Cooling Rebate Form must be completed online or mailed along with a copy of your receipt or invoice to the rebate processing center address. The rebate form can be accessed using one of the options at the bottom of this page. * Rebate will not exceed the total a customer paid for qualifying model. Refer to the Evaporative Cooling Eligibility List in the download section below for eligible units. EPE will only pay rebates for eligible units.